Hogback is inspired by Tim Severin’s book The Brendan Voyage. In the late 1970s, Severin built and sailed a medieval vessel from Ireland to Newfoundland in an attempt to prove the historical legitimacy of the Latin text Navigatio Sancti Brendani Abbatis. This epic recounts St. Brendan’s legendary journey across the Atlantic before the year 600 AD. Severin’s boat, Brendan, was built using medieval designs and traditional materials and techniques. It had an ash and oak internal frame and a hull of tanned ox hides that were sealed with lanolin. 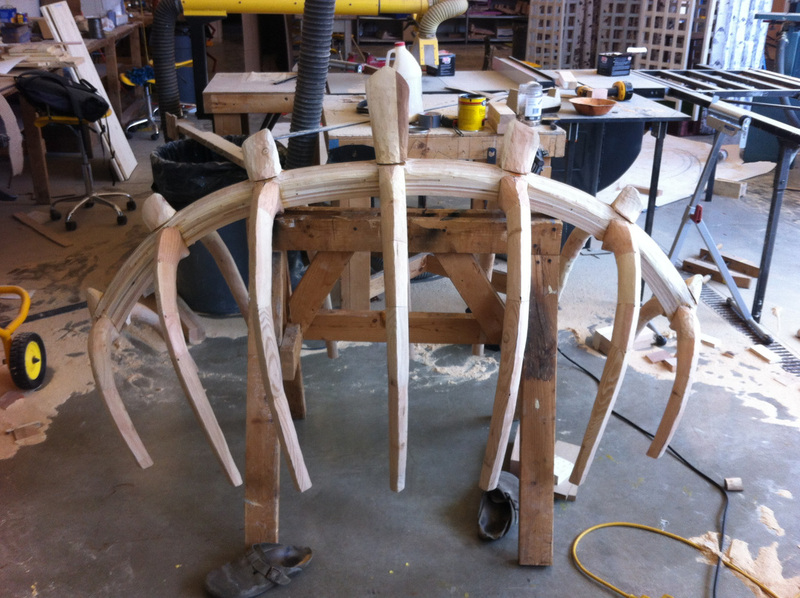 Brendan’s wooden skeleton and stretched leather skin made it look like an animal. The wool grease made it smell like one, too. On the sea, Brendan behaved like something alive, flexing and breathing with the swelling waves beneath it. In the book, as Severin and his crew rounded the Icelandic coastline, they looked over the stern to find their boat leading a pod of whales who had taken it to be one of their own. While working on another ship-related sculpture (Strake 2013), The Brendan Voyage led me to see boats and animals on a single spectrum. The title, Hogback, is a reference to a variety of Viking grave markers only found in the United Kingdom. These carved stone monuments resemble the curved arc of a spine as well as the pitched roof of a Scandinavian style house or the keel of an overturned boat. Hogbacks represent a place on the spectrum somewhere between the man-made human and natural worlds—the blending of the inanimate and the animate. I only became aware of the existence of these monuments after beginning the sculpture that would come to bear their name.